If you’ve been following my blog, you’ve surely noticed I’ve suspended daily news-link roundups for now. That’s because, with deadlines looming, I’m trying to force myself to work on my semester projects by limiting my Internet and social media until they’re finished. Writing on the blog was becoming a form of procrastination! But I have to show off this: my first-ever creation of a 3-D model and animation. 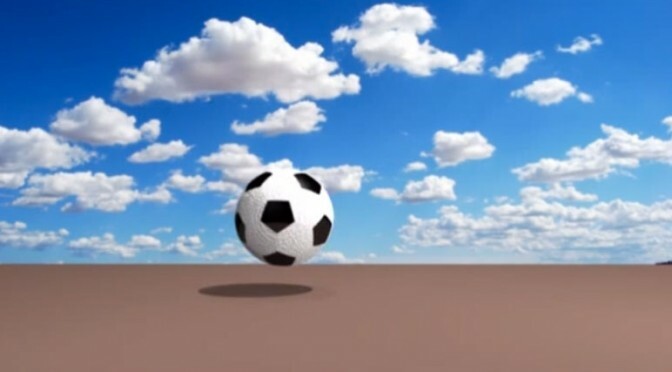 It’s a bouncing soccer ball, partly because my team’s multimedia course project for our N501 class on Foundations of Digital Production might require such a 3D special effect. I picked it also partly because I suspected it would be an easy object to model! To create the work, I used a trial version of Maya 2015, the industry-standard software. I was guided by tutorials from my fellow students and from Lynda.com on how to set up and render a realistic 3D virtual environment, particularly setting up three-point lighting in order to create shadows and adding the coloring and material texture that covers the geometric skeleton of the ball. I also owe a debt to a YouTube tutorial posted by TheArtAshram.com on creating a realistic soccer ball. This is actually the second video I produced. I created a much more realistic environment and soccer ball for a first draft — waving blades of grass for the ground; shiny leather and distinct stitching between the pentagonal ball segments; even more realistic bouncing motion — but my creaky old MacBook was not able to render the fine details successfully. Sigh. I downgraded it to a flat plane surface and a rougher Nerf-style texture for the ball in order to make sure the video output would show all my hard work. As frustrated as I was not to be able to show an even better example, I was psyched to receive 10 out of 10 on this assignment!